Sehrengiz is an Ottoman genre of poetry written in honor of various cities and provincial towns of the Ottoman Empire from the early sixteenth century to the early eighteenth century. This book examines urban culture of Ottoman Istanbul through Sehrengiz, as the Ottoman space culture and traditions have been shaped by a constant struggle between conflicting groups practicing political and religious attitudes at odds. By examining real and imaginary gardens, landscapes and urban spaces and associated ritualized traditions, the book questions the formation of Ottoman space culture in relation to practices of orthodox and heterodox Islamic practices and imperial politics. The study proposes that Sehrengiz was a subtext for secret rituals, performed in city spaces, carrying dissident ideals of Melami mysticism; following after the ideals of the thirteenth century Sufi philosopher Ibn al-'Arabi who proposed a theory of 'creative imagination' and a three tiered definition of space, the ideal, the real and the intermediary (barzakh). In these rituals, marginal groups of guilds emphasized the autonomy of individual self, and suggested a novel proposition that the city shall become an intermediary space for reconciling the orthodox and heterodox worlds. In the early eighteenth century, liminal expressions of these marginal groups gave rise to new urban rituals, this time adopted by the Ottoman court society and by affluent city dwellers and expressed in the poetry of Nedim. The author traces how a tradition that had its roots in the early sixteenth century as a marginal protest movement evolved until the early eighteenth century as a movement of urban space reform. 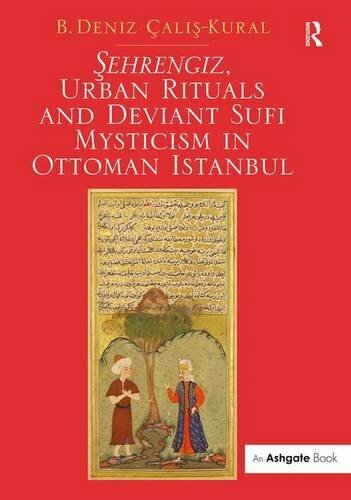 Sehrengiz, Urban Rituals and Deviant Sufi Mysticism in Ottoman Istanbul (1512-1732), is thrillingly bold, demonstrating that the Ottoman Sehrengiz were a function of the Melami sufi order. This is as breath-taking as to say that performances at the Globe Theater of Elizabethan England were a function of a secret mystical order penetrating the highest levels of government. Yet in this author's hands the exposition proceeds at a calm, comfortable pace, rigorously supported and comfortably thorough. - Victoria Holbrook, author of The Unreadable Shores of Love: Turkish Modernity and Mystic Romance. B. Deniz Çalis-Kural is an architect and historian of Ottoman landscape and urban culture. She was awarded a BArch. by METU, Ankara, Turkey; a March. by Pratt Institute, Brooklyn, NY and a PhD degree from METU. For her graduate studies, Çalis-Kural was granted fellowship from TUBITAK-The Scientific and Technological Council of Turkey (1996-1998). She was a junior fellow at Dumbarton Oaks Garden and Landscape Studies, Washington, DC (2003-2004). Her work has been published in TOPOS and Dumbarton Oaks Publications, among others. She has taught at Yeditepe and Bahçeşehir Universities of Istanbul. In 2010-2011, she was a visiting scholar at the University of Virginia, School of Architecture. Çalis-Kural teaches in the Istanbul Bilgi University Faculty of Architecture. 1. Sehrengiz, urban rituals and deviant Sufi mysticism in Ottoman Istanbul.